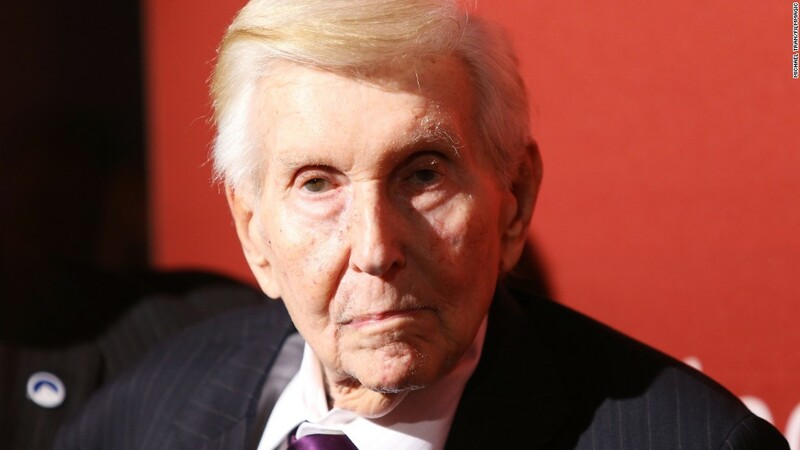 Sumner Redstone will almost certainly not be in a Massachusetts courtroom on Thursday when his attorneys and those representing Viacom convene for a hearing that may shape the future of his media empire. Public appearances by the 93-year-old Redstone, Viacom's controlling shareholder, have become rare. But public pronouncements by him have not. In a court filing last week, Redstone chastised Viacom CEO Philippe Dauman, who has argued that the aging mogul is being manipulated by his daughter, Shari Redstone. On Tuesday, Redstone signed his name to another public rebuke of Dauman -- a letter from the board directors of National Amusements, the Redstone-owned movie theater chain that controls 80% of Viacom's voting stock. 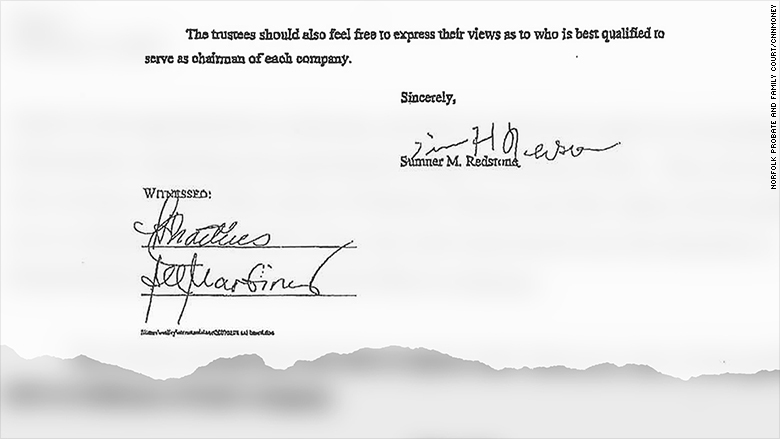 Tuesday's letter provided, by way of Redstone's signature, a reminder of the central issue in a convoluted legal drama that has at times felt like a Coen brothers screenplay: Redstone's competency. Dauman and Viacom board member George Abrams have asked a judge in suburban Boston to order an immediate medical examination of Redstone. Viacom lead independent director Fred Salerno requested the same of a Delaware court last week. Salerno, Abrams and Dauman have been the subject of major shakeups that they say were orchestrated by Shari Redstone. Dauman and Abrams filed a lawsuit last month in Canton, Mass., after they were ousted from the trust that will take control of Viacom and CBS when Sumner Redstone dies or is incapacitated. Earlier this month, Dauman, Abrams and Salerno were among five Viacom board members who were removed and replaced by National Amusements. Salerno has challenged that move in the Delaware Court of Chancery. The questions surrounding Redstone's health were the subject of another legal battle last year, when an ex-girlfriend named Manuela Herzer filed a lawsuit alleging that he did not have the mental competency to remove her as his health care agent. She had been replaced in that role by Dauman through other court documents also containing an illegible signature from Redstone. As part of that litigation, in November Dauman actually vouched for Redstone's competency, describing the tycoon as "engaged and attentive." Dauman, who has now clearly staked out a different position, was replaced by Shari Redstone as the health care agent in April. Sumner Redstone's attorneys have insisted that, though his speech is severely impaired, his mental competency is not. Reuters reported earlier this week that Viacom's board rejected a face-to-face meeting with Redstone that was requested by his attorneys. Redstone's attorneys have filed a motion to dismiss the lawsuit brought by Dauman and Abrams; that motion, among others, will be considered by a Massachusetts judge during Thursday's hearing. Attorneys for Dauman have pointed out that Redstone's relationship with his daughter has long been strained. In response to the motion to dismiss, Dauman's counsel presented to the court a pair of signed communications from Redstone in which he expressed misgivings about his daughter's business acumen. "Unfortunately, I have come to believe that Shari does not have the requisite business judgment and abilities to serve as chairman of the three companies," Redstone said in a 2007 letter to trustees, referring to Viacom, CBS and National Amusements. His signature then was slightly more legible. Redstone filed an affidavit in the court last week, asking the judge to move the litigation to California. The notion that he was "unduly influenced" by his daughter, he said, "is offensive and untrue." But in their letter on Tuesday, Redstone and the other National Amusements directors argued that it wouldn't matter even if the claims of undue influence or mental incompetency were proven to be true. Neither the changes to the board nor the trust would be invalidated, they said.